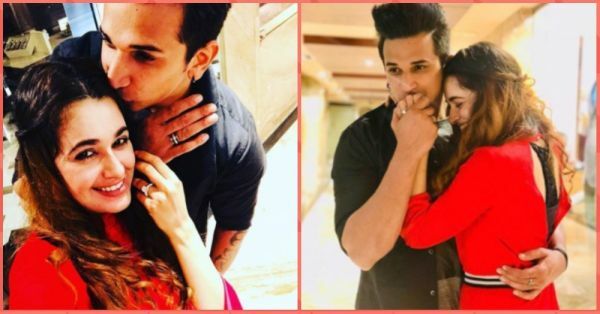 Prince Narula & Yuvika Choudhary Announced Their Engagement In The Most *Filmy* Way Ever! "Thanku baby thanku so much still can't sink in me that u said yes to me n u r my mine forever nw lovers for life#engaged and yes one one thing mehndi laga k rakhna doli saja k rakhna lene tujhe a gori aye ga Tera prince #love#life#hugs#thanku god #waheguru#blessed"
"Can’t believe this just happened love u beba #forlife❤ thank u for asking me .. for holding my hand.. for believing in us.. for being my partner for forever n beyond.... cheers to US 💑.... to new beginnings.. n to a lifetime of love n memories.. Forever yours.. always 💍♥️ #engaged@princenarula"
The news of Prince and Yuvika getting married has left their fans and wellwishers super excited. Close friend Vikas Gupta posted an adorable photo of the couple and wished them on Twitter. Prince and Yuvika met during the popular reality TV show Bigg Boss 9 and have been together ever since. The lovebirds were last seen together as special judges for a task on MTV's Splitsvilla. We wish them a great life ahead!